Beware of campaigning charities pushing for more laws. They take years to formulate and they can become addictive. A charity can grow rich as the fundraising team make the most of all those press releases, launches and meeting with officials. The policy team love it: they will be centre stage at the important meetings. The PR team love it: new legislation is easy to understand, easy to explain, unlike some conservation issues. Campaigning charities don’t even have to pay for it – they expect the taxpayer to do that. The best bit is at the end: they don’t carry the blame if it’s ineffective – the politicians do. For years, reported incidents of wildlife crime have been falling twice as fast as the national crime rate. So this is either a fast diminishing problem and so we don’t need more laws; or these criminals are getting better at hiding their crime. Since laws can’t fight hidden crime, making new ones is not going to make a great deal of difference. Just look at Scotland - in 2011, after years of campaigning, they passed new laws. The police have not made a single prosecution. It has not solved the situation. What we need is more common sense. Clearly we need to tackle the cause of crime, as well as the crime itself. Take a close look at the motive for the illegal killing of a hen harrier by a gamekeeper on a grouse moor. A joint study by the RSPB and the GWCT demonstrated that hen harrier numbers can quickly increase in a small area, eat too many grouse, and put the gamekeeper out of a job. Sadly, once the gamekeepers are made redundant, there is not enough food, so the hen harrier population crashes back down. A lose-lose situation. The RSPB are jointly funding a ‘best practice’ driven grouse moor at Langholm. The idea is to show gamekeepers how you can have hen harriers alongside grouse. No illegal killing. After 7 years of determined effort, it has achieved two important objectives but has failed to achieve the one key objective that would reduce the motive for illegal killing. The motive remains in place and new laws will not change that. Despite the RSPB’s investment at Langholm clearly showing that such laws can’t resolve the conflict they still continue to campaign for new laws. We all know this. There is no surprise that law enforcement is an essential part of the proposed Defra recovery plan for hen harriers in England. There are five other parts to this plan – none require new laws. Perhaps it is time for campaigning charities to spend less time telling everyone else what to do and reflect on what they need to do? 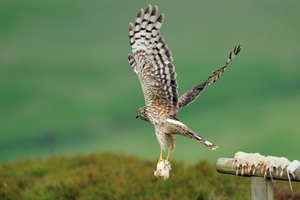 Right now, the RSPB are also campaigning to stop Defra implementing its hen harrier recovery plan. They only want the ‘workable’ parts to be implemented – or put another way ‘the bits the RSPB likes’. Sadly the bits the RSPB like are just more of the same. Surely it’s time to stop objecting and start embracing conservation techniques that increase bird of prey numbers around the world – the ones that remove the motive for crime? Our birds of prey need new thinking and new leadership - not new laws. Who will pay for these extra Wildlife Crime Officers which you say are required to tackle the illegality which you concede is perpetrated by grouse moor owners, Andrew, the tax payer? The licensing scheme proposed by the RSPB would presumably provide some of these funds? Another thing that would really help would be for GWCT to work hard to stamp out the law breaking you say takes place on grouse moors. And why are you campaigning so hard to prevent the public from being consulted on 'brood management'? If your case for it is so compelling, what do yo fear? There is ample time for a six week consultation period ahead of the 2015 breeding season. And actually given that there were only four pairs of hen harriers in England this year, brood management would hardly be appropriate in 2015, would it? I should add, I do have sympathy with some of the points you make: I can see where you're coming from regarding high hen harrier density. But you fail to fess up about what brood management is really about. It's not a conservation tool in this instance - it's a way of holding the hen harrier population at a density at which it won't adversely affect grouse shooting. If the estates did not hide or condone the criminals killing birds of prey to protect a few grouse, then the criminality would surely be very much reduced. Sadly, the estates and their employees see predators as a negative resource and therefore to be rid of. It is time to get tough on this sick industry that has destroyed the Hen Harrier population in England. Vicarious liability is the only way forward. Some day a brave gamekeeper will speak up and let us know that it is in their unwritten contract to kill birds of prey. Of course it could be argued that the law in Scotland is having an impact in reducing the number of incidents because the landowner is now risking prosecution and not just the specific perpetrator. We should also be careful about correlations between recorded incidents and prosecutions and the scale of persecution for what is by its very nature, an easy crime to conceal. And the iceberg underneath does not have to be very big to have an impact on a bird that numbers in the hundreds of breeding pairs. The fact that hen harriers do consistently better away from most grouse moors supports the notion that persecution is a big factor. Especially as grouse moor management including predator control is regularly lauded for benefiting ground-nesting upland birds. While the Langholm study is oft-quoted as the test case for hen harrier/grouse moor interaction, other places can demonstrate success. Until recently, the English Bowland Forest stronghold for the hen harrier and other birds of prey was a grouse moor managed by a landowner sympathetic to conservation of the hen harrier. Their recent decline even here, is put down to intensification of persecution with this year's recovery with 3 successful breeding pairs confined to the "protected" moor but not adjoining grouse moors. All this suggests that the key parts of the Hen Harrier Action Plan are the measures to reduce persecution. Focusing on addressing the motive is a distraction - persecution is illegal and should stop and no-one should be turning a blind eye to it. This does not require any plan of course but there seems a clear inference - sign up to the plan in full or hen harrier numbers will not recover because the persecution is allowed to continue.